Harmony is a beautifully presented 2 x bedroom 2 x bathroom apartment that has just been refreshed in the sought after Broadbeach precinct, walking distance to the main cafe strip and patrolled beaches that Broadbeach is renowned for which means this little gem is just perfect for your next holiday. The property boasts a large master bedroom with a queen bed and ensuite with the second bedroom fitted with 2 x single beds. The property is fitted with all the mod cons starting with the lift to take you directly to the top floor (3rd floor) along with the dishwasher, washing machine, dryer, fully fitted out kitchen, separate lounge and dining area, 3 balconies all with views and underground secure parking for 1 car, free WI-Fi 'and the list just goes on'. 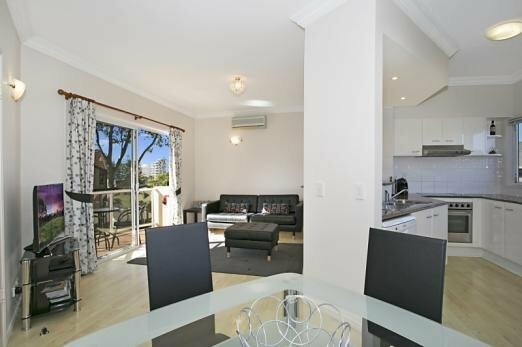 Please note that you are just a stones throw away from the Broadbeach Bowling Club which is a brilliant spot for a meal, Jupiters Casino and Pacific Fair shopping center. additionally you have the benefit of the light rail close by with the bus almost at your doorstep that can take you anywhere you need to go, including all the THEME PARKS. Note No party policy - Responsible Respectful Clients Required - No smoking inside - We cannot accept schoolies bookings or group bookings over the schoolies period, we are also unable to automatically accept group bookings who live between Brisbane to the Gold Coast. Christmas and New Year Bookings If you're booking covers both Christmas Day and New Years Eve then the booking must be at least 12 days in length. Christmas and New Year Bookings have a 7 night minimum stay and Christmas week bookings must start from 19th or 20th of December and New year bookings must start from the 27th or 28th of December - If you're booking covers both Christmas Day and New Years Eve then the booking must be at least 12 days in length. Nightly rate for a 3 night stay. Nightly rate for a 4 night stay. Nightly rate for a 5 night stay. Nightly rate for a 6 night stay. Nightly rate for a 7 night stay.